Give Your Home a Refresh This Spring! New York, NY - After a long, chilly winter, nothing lifts spirits like the first signs of spring. Spring is a time to pack up the old, usher in the new, kick off the snow boots, and slip on the sandals. With some creativity, open-mindedness and a little elbow grease, you can clean out and update your home without breaking the bank. 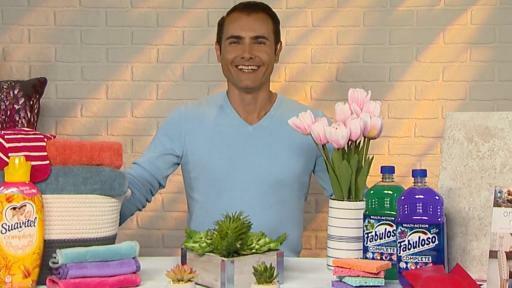 If the warm weather has you itching to refresh your home, DIY and design expert Martin Amado will help you say goodbye to winter with his top tips that will leave the home sparkling! He’ll help homeowners tackle springtime updates by starting with a thorough cleaning and then adding fresh and trendy décor swaps and upgrades. Deep clean: Start the season off with a thorough home cleaning. Wipe down surfaces with multipurpose cleaner that disinfects and leaves the home smelling fresh! Fabuloso® Complete™ is a new multi-surface, multi-action cleaner that delivers a powerful clean all around your house. It cuts through grease, removes lime scale, and helps remove stains, all with the great fragrance you remember from Fabuloso®. Use it on almost any hard surface in your house, like walls, bathrooms, and floors. It comes in two varieties, Floral Burst and Cool Mist, and will be available at select retailers like Family Dollar, Walmart, and online. Laundry refresh: Switch out your winter wardrobe and freshen up your spring wardrobe. Make sure you’re using the correct amount of detergent and don’t forget to add the fabric conditioner for that added softness! New Suavitel® Complete™ fabric softener has superior technology that helps keep clothes looking newer longer. The new formula provides advanced softening vs. regular density, as well as long-lasting color protection and wrinkle reduction after 5 washes, tested on cotton and cotton-polyester fabrics, compared to washing with detergent alone. Comes in two favorite scents, Field Flowers® and Morning Sun®. Outdoor cleaning: Pressure wash the exterior of your home, deck and patio furniture. For many of us, spring calls for new clothes. For your house, that might mean a fresh coat of paint. Check for any paint on your house or deck that is peeling and reseal any wood to prevent any future rot. Bring the outdoors in: Tropical and floral prints are a big design trend and can be incorporated with decorative accessories such as wall art and pillows. You can also incorporate plants and greenery indoors by hanging macramé baskets or placing them on bookshelves or even inside geometric glass containers. Container gardens can also spruce-up a front entrance or deck.